The plant can grow to 60cm tall, with large glossy leaves. It is a hardy perennial which has medicinal and culinary uses. The leaves have a mild pungent flavour, and are used raw, and cooked. 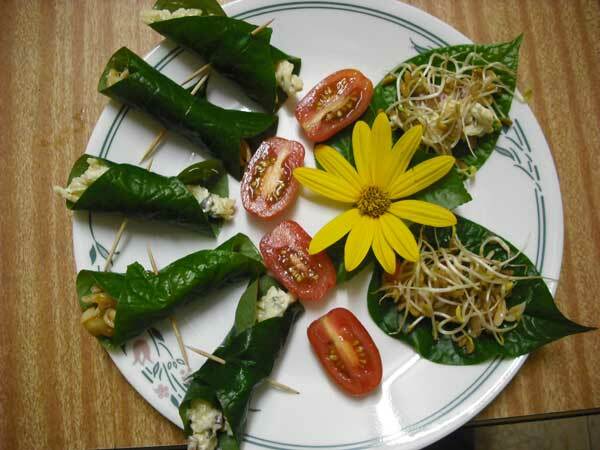 A traditional way of preparing the leaves is as a wrapping for spiced minced meat and other morsels. In Thailand, these wraps are a favourite snack, using an assortment of fillings, like peanuts, shrimps, shallots with lime and raw ginger. Because the leaves are so attractive, they are often used as a base for decorating platters, with foods arranged on top. The white flower spikes develop into seed/fruit that looks a little like a green/brown mulberry when ripe and can be eaten; it is a tasty morsel of sweet jelly-like pulp. Betel leaf Wrap (Piper sermentosum) Betel Leaf Wrap Recipe: 500g peeled and chopped prawns 100g crushed toasted peanuts 300g sprouts Thumb sized piece of ginger finely diced Juice from half a lime Two sprigs of spring onions finely copped Half a cup of chopped coriander leaves 5 drops of sesame oil 1 rounded teaspoon palm sugar warmed to melted stage 1 cup cooked rice Fresh Betel Leaves Steamed version: Combine all ingredients and mix gently but thoroughly before scooping onto betel leaves. Wrap approximately 1 teaspoon of mixture in each leaf and place in steamer. Steam lightly and serve with dipping sauces. Raw leaf version: Lightly cook ginger, peanuts and spring onions and add remaining ingredients for only a few minutes until prawns are cooked. Add coriander leaves and wrap in younger raw leaves a teaspoon at a time.